Jadin Bell, age 15, was taken off life support today. 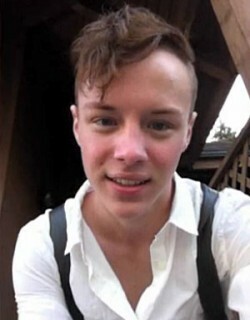 Huffington Post- Gay Voices reported tonight that 15-year-old Jadin Bell of La Grande, Oregon was taken off life support and died early today. The gay high school sophomore hung himself in his high school playground after what a family friend described as an intense period of bullying by his peers. The greatest challenge confronting America and much of the world was, is and will continue to be the emotional immaturity of those who genuinely fear navigating life in a world in which there are other people who don’t share their point of view; people who don’t conform to their ideas about what is normal; people who don’t share their religious and political beliefs. How sad. One can’t help but wonder how such intolerant commoners reconcile such simplistic reasoning with the message of “religious”conservatives usually claim to have such a passionate knowledge of and adherence too. Rest in peace Jadin. I never met you but I’ll bet my life you were a better person than any of the people hassled and bullied you. You can be sure that many of us will continue the fight for the rights of sensitive people who don’t necessarily conform to other people’s ideas of what is normal. I promise. God willing. Next Next post: If You Really Think You Need Protection From Your Own Government……..